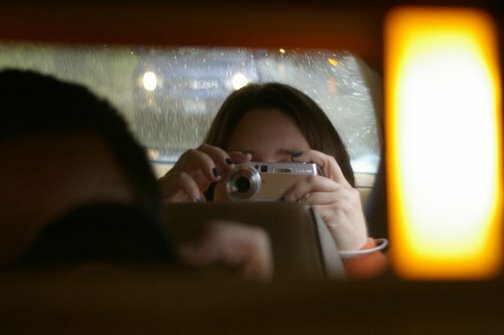 SnarkyDork: When Did I Become So Damn Girly? I find this photo very amusing. 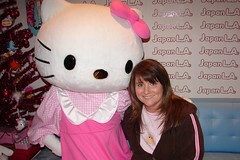 Not only am I wearing a pink shirt and a jacket with pink stripes down the sleeves, but I'm posing with Hello Kitty. I don't really think of myself as being very "girly," but I think I'd have a hard time convincing anyone of that in this instance. E and I went to the JapanL.A. party featuring the big cat-with-no-mouth herself, as I previously mentioned. I'd been looking forward to going in the shop, which is pretty small, but filled with an array of glorious Japanese pop culture goodies. 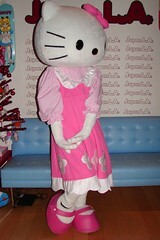 There were snacks, drinks, and good cheer while folks waited around for Hello Kitty to make her appearance. Once she arrived, I was a bit stunned by the size of the costume. It's pretty tall. I was really taken with the shoes, for some odd reason. That girly thing again? I took some photos and giggled quite a bit. I was really amused by the number of males who were having a great time getting their picture taken with Miss Kitty. I did purchase a few cute little things, for a grand total of less than $5. I'm sure I will spend more there in the future. Luckily, the store did not have the tokidoki LeSportsac bag that I want. Even at 30% off, I'd have a hard time justifying it right now. Footnote: I actually do have a history of posing with cute costumed characters, such as Hamtaro and Snoopy. Jessie is VERY envious! She is a big Hello Kitty fan. Of course she is only FIVE. Not that I'm saying anything. Nope. Not saying anything here. How delightful!! That must have been marvelous.